Western Forest Products chairman Dominic Gammiero is retiring and leaving the company’s board of directors. Gammiero, who joined the board in 2006, served as Western’s CEO between October 2010 and February 2013, and as chairman thereafter. Taking over as chairman is Lee Doney, who has played a role in the company’s turnaround since its restructuring completed in 2004. Dana Hayden’s resumé includes stints in B.C.’s ministries of forests, advanced education and economic development Dana Hayden knows how to wield a chainsaw – and how to handle complex international trade negotiations. The accomplished civil servant, who has degrees in forestry and economics, has held numerous positions with the British Columbia government in a wide range of ministries, including forestry, advanced education and economic development. Vancouver, BC – The Council of Forest Industries (COFI) announces a reconstituted Board of Directors consisting of 14 Chief Executive Officers representing forest companies operating in British Columbia’s interior. One of the CEO Board’s first actions was to establish a Management Committee consisting of senior operational staff from the industry. “My colleagues and I believe that having a Board comprised of the forest industry’s CEOs demonstrates our dedication to COFI and its representation of our sector,” stated newly elected board Chair, Ted Seraphim, President and CEO of West Fraser. Criminal charges could theoretically still be laid in the Lakeland Mills blast, but they are not the primary objective of provincial Crown. Government prosecutors are reviewing the case file presented late last week by WorkSafeBC, which is recommending regulatory charges only, and despite the fact the workplace safety agency presumably used the same investigational methods for Lakeland as they did for the Babine mill blast. Provincial Crown discredited the entire methodology and dismissed the Babine case without even attempting to bring it to trial. Underground utilities complete. Harris anticipates vertical construction to begin within 30 days. Klausner Lumber One LLC could soon begin construction on a sawmill that will be located at the catalyst site in Northwestern Suwannee County. Meanwhile, improvements continue on county owned land at the catalyst site. …According to County Administrator Randy Harris, the general contractor for Klausner is on site and ready to begin construction immediately. To date, the company has installed underground utilities and is ready to begin vertical construction. Restructuring is expected in the timber industry in the Nelson region as log exports bypass local sawmills. The New Zealand Timber Industry Federation believes that there will need to be changes to the structure of the Nelson and Marlborough sawmilling industry for the sector to grow in the face of challenges. “The ability of sawmills to get a secure and constant supply of logs to cut has been a major problem in the region and has forced some operations to take a long look at their production focus,” said the federation’s chief executive Brent Coffey. Södra’s Board of Directors made the decision to invest SEK 4 billion (around $610 million) to implement a major expansion of the pulp mill in Värö. Work is now starting to increase the current production capacity of 425,000 tpy to 700,000 tpy of pulp. This will make the mill one of the biggest in the world in terms of softwood sulphate pulp production, as the company said in the press release received by Lesprom Network. “This expansion is a vital part of our strategy, and a must if we are to be able to develop our business. A subsidiary of IKEA that supplies timber to the furniture maker has been stripped of its Forest Stewardship Council (FSC) accreditation following an audit. Swedwood Karelia had its FSC certificate suspended after an audit in Russia found a number of problems, including harvesting of “key biotopes”, or important wildlife habitats; the lack of a proper environmental impact assessment; and lack of protective equipment for workers. A report by the Rainforest Alliance, which carries out audits for the FSC, said: “During the field inspections, auditors found key biotopes had not been identified before harvest and harvested. Harvests of key biotopes were found also at the harvest areas of previous years. The B.C. government has called for a full review of lands owned by conservation groups, to determine how many areas that were set aside to protect wildlife habitat have been leased out by the Crown as cattle range. Forest, Lands and Natural Resources Minister Steve Thomson promised the review Tuesday, in response to concerns raised by Ducks Unlimited Canada, The Nature Trust and the Habitat Conservation Trust Foundation. …Under the proposed changes, grazing tenures, which ranchers acquire so their cattle can range freely on Crown land, would be extended to cover a period of 20 or 25 years, not 10 years. Barrista, shmarrista. Ontario university grads have the best odds of landing jobs in their fields at good wages, according to a feisty new report from the Council of Ontario Universities that disputes any notion its members are glorified prep schools for a life making lattes. 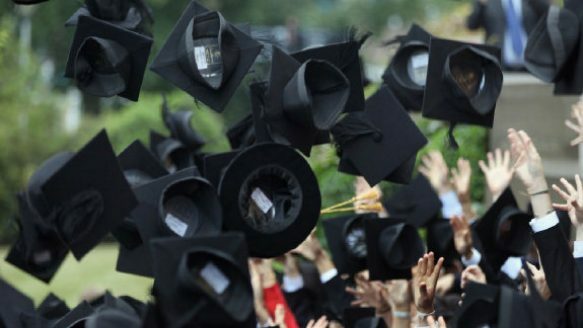 …Students in 23 university disciplines boast a 90 per cent employment rate within two years of graduation, noted the report, and a full 100 per cent are employed in dentistry, pharmacy, forestry, veterinary medicine and theology. BEND, Oregon — A 2012 fire that caused hazardous air quality in parts of Central Oregon is a good example of why forests should be thinned to prevent scorching wildfires, a state study concludes. Fire suppression efforts left the woods in the Pole Creek Fire overgrown and prone to larger and more severe wildfires, says the study by the Oregon Health Authority and the state Department of Forestry. The Pole Creek fire was the largest in Central Oregon in 2012, burning on more than 41 square miles of forest late that summer and early fall, the Bend Bulletin reported. EUGENE, Ore. – Thousands of people visited the Oregon Logging Conference this weekend, higher attendance than the past two years. 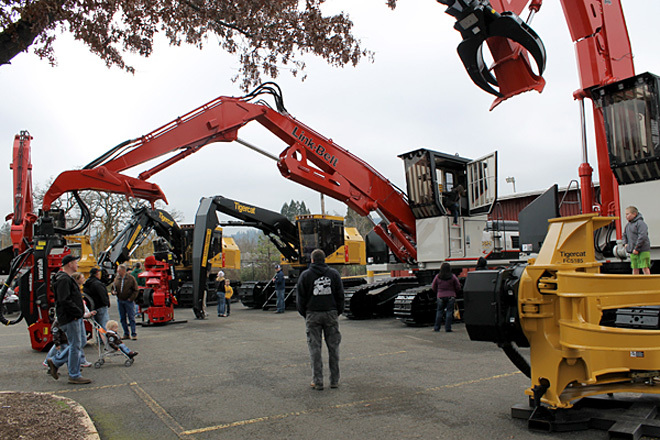 “It has been a great experience this year and a much better turnout from last year,” said Dan Brown of Crowley Equipment, a Eugene company that buys and resells machinery. …Over the course of three days, guests were able to view or take part in logging activities, such as cutting timber, experiencing machine simulators and sitting inside logging trucks and heavy equipment. The forest-based economy of the states of Maine, New Hampshire, New York and Vermont is an important component of the region’s economic health, according to new research by the North East State Foresters Association and the Northern Forest Center. Forest-based economic activity annually contributes more than $33 billion and provides 178,000 jobs to the four-state region. “These reports show how integral the forests of the region are to the economic health of the Northeast,” said Steve Sinclair, chair of the North East State Foresters Association and state forester of Vermont. What to do with the surfeit of wood likely to result as Iowa’s ash trees succumb to the emerald ash borer is a “big concern,” said State Forester Paul Tauke. “That’s going to be a huge issue” in the next several years as most of Iowa’s approximately 55 million ash trees die, Tauke said. So far the state has recorded infestations of the tree-killing insects in eight counties, and Tauke and other officials expect the pest to kill almost all Iowa’s ash trees within a decade. Environmental group Greenpeace on Wednesday accused US consumer goods giant Procter & Gamble of being responsible for the destruction of Indonesian rainforests and the habitat of endangered orangutans and tigers. In an extensive new report, Greenpeace said the company was using Indonesian palm oil from suppliers with links to the destruction of ancient rainforest, haze-inducing forest fires and an orangutan “graveyard”. The company uses Indonesian palm oil in its popular household products, including Head & Shoulders and Pantene shampoos and Gillette shaving gel. With its steep, forested mountains set against blue skies, Romania’s central Pojarna Valley once looked like a postcard landscape but illegal logging has turned the site into an ugly scar. “The guys who did this used excavators. They even destroyed the young trees,” said Gheorghe Ridichie, an official at Romania’s forestry ministry, pointing to thousands of stumps poking out of the valley’s now-barren slopes. Last year, authorities rallied to halt rampant deforestation in the Balkan state. 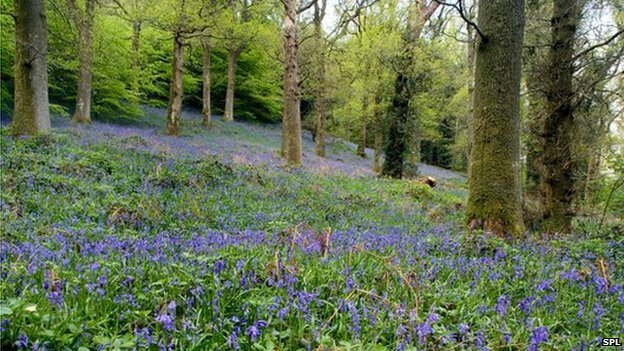 The scale of ancient woodland being lost to development in Britain is being made worse because of a lack of accurate data. The Woodland Trust says that systems are so poor, the government cannot say how much ancient forest has disappeared in the last 10 years. However, a new report from the Forestry Commission says that the UK’s tree cover has increased significantly. They say the amount of forest has more than doubled in the last 100 years. Ancient woodland is defined as forests that have been in existence since 1600. ROTHSCHILD — The recently built power plant at Domtar paper mill is getting only 10 percent of its fuel from logging waste, which originally was supposed to supply nearly all of the plant’s energy needs. The 50-megawatt, $255 million power plant went online in November to provide steam for Domtar’s paper operations and a clean source of power for WE Energies. The plant will burn 500,000 tons of biomass annually, said Cathy Schulze, a WE Energies spokeswoman. WE Energies told the Wisconsin Public Service Commission in its permit applications, which were required to build the facility, that logging waste would supply the vast majority of the plant’s fuel. Fires in the Amazon could jeopardize the forest’s ability to soak up carbon dioxide emissions even as deforestation there slows down, according to a Penn State geographer. In an invited commentary in the Feb. 6 edition of Nature, Jennifer Balch, assistant professor of geography, noted that dry weather conditions, coupled with fires, may mean that over time the Amazon forest will lose its ability to take in more carbon dioxide than it releases—going from being a carbon sink to a source.